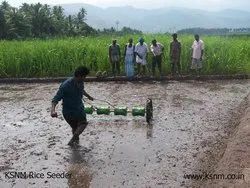 Rice Seeder is meant for sowing Pregerminated paddy in wetland field. 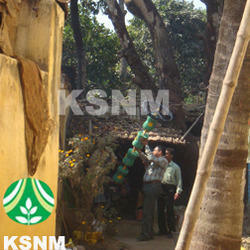 Its is manually pulled implement. It covers 8 rows simultaneously. Paddy Seeder is for sowing germinated paddy seed directly in wetland field. There is no need for transplantation. It is a manually pulled implement. It covers 8 rows of 20cm row-to-row spacing at a time. It is made up of plastic materials. With an aim to fulfill the wide needs of the agricultural sector, we are affianced in offering supreme quality Paddy Seeder that is a gardening equipment used to plant rice seeds. It is designed & manufactured using the finest quality components and sound techniques under the supervision of skilled professionals. To ensure its flawlessness at clients' end, the offered Paddy Seeder is tested on various parameters by our quality controllers prior to dispatching the delivery from our end. 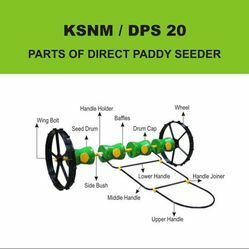 KSNM Direct Paddy Seeder is an efficient and inexpensive implement for row sowing of pre-germinated paddy seed in wet land field. 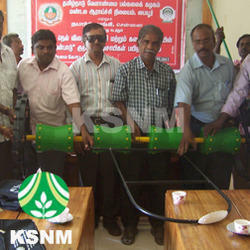 This is a manually pulled implement developed and certified by Tamil Nadu Agricultural University, Coimbatore, India. KSNM Direct Paddy Seeder covers 8 rows of 20 cm row to row spacing at a time. This implement ensures uniform plant population throughout the field. Field must be well puddled and leveled. Wate must be drained out atleast 24 hrs before sowing to form hardslurry pan of puddle soil. At the time of sowing, only paper thin of water should be maintained in the puddled field. Water should be flooded to the puddled field once in three days after sowing and drained out immediately. This practice must be continued for 12 days. Thereafter depending upon the height of the seeding, Water should be allowed to stand in the field. After assembling, fill the drums with pre-germinated seeds. Remember only two-third of the drum are to be filled at a time. Close the mouth with the knob provided. Pull the seeder manually at a normal walking speed (1 Km/h) in the backward position as in the photo. The wheel impression in the first pass will server as a maker. In the second pass the wheel should pass on the same wheel impression of the previous pass to maintain the row- to-row spacing of 20 cm. Occasionally watch the dropping of the seeds through the holes of the seeder . Refill the drum when it reaches one fourth capacity. · Continuous drilling of seeds is eliminated. · Reduction in seed rate and thinning cost. · An area of 1 hectare per day can be shown. Direct Paddy Seeders is for sowing germinated paddy seed directly in wetland field. There is no need for transplantation. It is a manually pulled implement. It covers 8 rows of 20cm row-to-row spacing at a time. It is made up of plastic materials. With an aim to fulfill the wide needs of the agricultural sector, we are affianced in offering supreme quality Direct Paddy Seeders that is a gardening equipment used to plant rice seeds. It is designed & manufactured using the finest quality components and sound techniques under the supervision of skilled professionals. To ensure its flawlessness at clients' end, the offered Direct Paddy Seeders is tested on various parameters by our quality controllers prior to dispatching the delivery from our end. 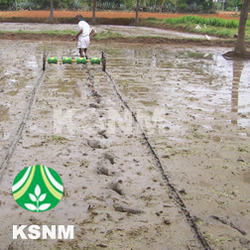 Wetland Seeder is for sowing germinated paddy seed directly in wetland field. There is no need for transplantation. It is a manually pulled implement. It covers 8 rows of 20cm row-to-row spacing at a time. It is made up of plastic materials. With an aim to fulfill the wide needs of the agricultural sector, we are affianced in offering supreme quality Wetland Seeder that is a gardening equipment used to plant rice seeds. It is designed & manufactured using the finest quality components and sound techniques under the supervision of skilled professionals. To ensure its flawlessness at clients' end, the offered Wetland Seeder is tested on various parameters by our quality controllers prior to dispatching the delivery from our end. 8 Row Drum Seeder is for sowing germinated paddy seed directly in wetland field. There is no need for transplantation. It is a manually pulled implement. It covers 8 rows of 20cm row-to-row spacing at a time. It is made up of plastic materials. With an aim to fulfill the wide needs of the agricultural sector, we are affianced in offering supreme quality 8 Row Drum Seeder that is a gardening equipment used to plant rice seeds. It is designed & manufactured using the finest quality components and sound techniques under the supervision of skilled professionals. To ensure its flawlessness at clients' end, the offered 8 Row Drum Seeder is tested on various parameters by our quality controllers prior to dispatching the delivery from our end. 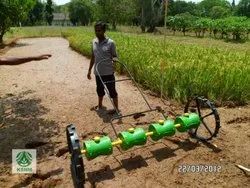 8 Row Plastic Drum Seeder is for sowing germinated paddy seed directly in wetland field. There is no need for transplantation. It is a manually pulled implement. It covers 8 rows of 20cm row-to-row spacing at a time. It is made up of plastic materials. With an aim to fulfill the wide needs of the agricultural sector, we are affianced in offering supreme quality 8 Row Plastic Drum Seeder that is a gardening equipment used to plant rice seeds. It is designed & manufactured using the finest quality components and sound techniques under the supervision of skilled professionals. To ensure its flawlessness at clients' end, the offered 8 Row Plastic Drum Seeder is tested on various parameters by our quality controllers prior to dispatching the delivery from our end. Agriculture Machinery Rice Seeder is for sowing germinated paddy seed directly in wetland field. There is no need for transplantation. It is a manually pulled implement. It covers 8 rows of 20cm row-to-row spacing at a time. It is made up of plastic materials. With an aim to fulfill the wide needs of the agricultural sector, we are affianced in offering supreme quality Agriculture Machinery Rice Seeder that is a gardening equipment used to plant rice seeds. It is designed & manufactured using the finest quality components and sound techniques under the supervision of skilled professionals. To ensure its flawlessness at clients' end, the offered Agriculture Machinery Rice Seeder is tested on various parameters by our quality controllers prior to dispatching the delivery from our end. Agriculture Direct Paddy Seeder is for sowing germinated paddy seed directly in wetland field. There is no need for transplantation. It is a manually pulled implement. It covers 8 rows of 20cm row-to-row spacing at a time. It is made up of plastic materials. With an aim to fulfill the wide needs of the agricultural sector, we are affianced in offering supreme quality Agriculture Direct Paddy Seeder that is a gardening equipment used to plant rice seeds. It is designed & manufactured using the finest quality components and sound techniques under the supervision of skilled professionals. To ensure its flawlessness at clients' end, the offered Agriculture Direct Paddy Seeder is tested on various parameters by our quality controllers prior to dispatching the delivery from our end. Agriculture Paddy Seeder is for sowing germinated paddy seed directly in wetland field. There is no need for transplantation. It is a manually pulled implement. It covers 8 rows of 20cm row-to-row spacing at a time. It is made up of plastic materials. With an aim to fulfill the wide needs of the agricultural sector, we are affianced in offering supreme quality Agriculture Paddy Seeder that is a gardening equipment used to plant rice seeds. It is designed & manufactured using the finest quality components and sound techniques under the supervision of skilled professionals. To ensure its flawlessness at clients' end, the offered Agriculture Paddy Seeder is tested on various parameters by our quality controllers prior to dispatching the delivery from our end. 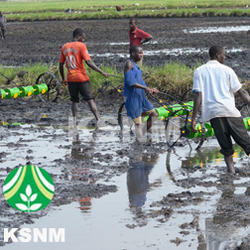 Hand Paddy Transplanter is for sowing germinated paddy seed directly in wetland field. There is no need for transplantation. It is a manually pulled implement. It covers 8 rows of 20cm row-to-row spacing at a time. It is made up of plastic materials. With an aim to fulfill the wide needs of the agricultural sector, we are affianced in offering supreme quality Hand Paddy Transplanter that is a gardening equipment used to plant rice seeds. It is designed & manufactured using the finest quality components and sound techniques under the supervision of skilled professionals. To ensure its flawlessness at clients' end, the offered Hand Paddy Transplanter is tested on various parameters by our quality controllers prior to dispatching the delivery from our end. 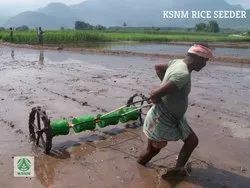 Man Power Rice Seeder is for sowing germinated paddy seed directly in wetland field. There is no need for transplantation. It is a manually pulled implement. It covers 8 rows of 20cm row-to-row spacing at a time. It is made up of plastic materials. With an aim to fulfill the wide needs of the agricultural sector, we are affianced in offering supreme quality Man Power Rice Seeder that is a gardening equipment used to plant rice seeds. It is designed & manufactured using the finest quality components and sound techniques under the supervision of skilled professionals. To ensure its flawlessness at clients' end, the offered Man Power Rice Seeder is tested on various parameters by our quality controllers prior to dispatching the delivery from our end. Man Power Direct Paddy Seeder is for sowing germinated paddy seed directly in wetland field. There is no need for transplantation. It is a manually pulled implement. It covers 8 rows of 20cm row-to-row spacing at a time. It is made up of plastic materials. With an aim to fulfill the wide needs of the agricultural sector, we are affianced in offering supreme quality Man Power Direct Paddy Seeder quality components and sound techniques under the supervision of skilled professionals. To ensure its flawlessness at clients' end, the offered Man Power Direct Paddy Seeder is tested on various parameters by our quality controllers prior to dispatching the delivery from our end. TNAU Paddy Seeder is for sowing germinated paddy seed directly in wetland field. There is no need for transplantation. It is a manually pulled implement. It covers 8 rows of 20cm row-to-row spacing at a time. It is made up of plastic materials. With an aim to fulfill the wide needs of the agricultural sector, we are affianced in offering supreme quality Plastic Drum Seeder that is a gardening equipment used to plant rice seeds. It is designed & manufactured using the finest quality components and sound techniques under the supervision of skilled professionals. To ensure its flawlessness at clients' end, the offered Plastic Drum Seeder is tested on various parameters by our quality controllers prior to dispatching the delivery from our end. 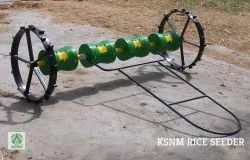 Paddy Drum Seeder is for sowing germinated paddy seed directly in wetland field. There is no need for transplantation. It is a manually pulled implement. It covers 8 rows of 20cm row-to-row spacing at a time. It is made up of plastic materials. With an aim to fulfill the wide needs of the agricultural sector, we are affianced in offering supreme quality Paddy Drum Seeder that is a gardening equipment used to plant rice seeds. It is designed & manufactured using the finest quality components and sound techniques under the supervision of skilled professionals. To ensure its flawlessness at clients' end, the offered Paddy Drum Seeder is tested on various parameters by our quality controllers prior to dispatching the delivery from our end. 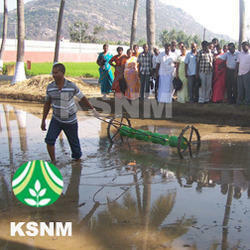 KSNM Seeder is for sowing germinated paddy seed directly in wetland field. There is no need for transplantation. It is a manually pulled implement. It covers 8 rows of 20cm row-to-row spacing at a time. It is made up of plastic materials. 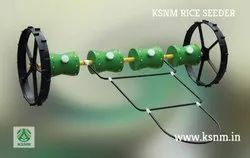 With an aim to fulfill the wide needs of the agricultural sector, we are affianced in offering supreme quality KSNM Seeder that is a gardening equipment used to plant rice seeds. It is designed & manufactured using the finest quality components and sound techniques under the supervision of skilled professionals. To ensure its flawlessness at clients' end, the offered KSNM Seeder is tested on various parameters by our quality controllers prior to dispatching the delivery from our end. Improved Direct Paddy Seeder is for sowing germinated paddy seed directly in wetland field. There is no need for transplantation. It is a manually pulled implement. It covers 8 rows of 20cm row-to-row spacing at a time. It is made up of plastic materials. With an aim to fulfill the wide needs of the agricultural sector, we are affianced in offering supreme quality Improved Direct Paddy Seeder that is a gardening equipment used to plant rice seeds. It is designed & manufactured using the finest quality components and sound techniques under the supervision of skilled professionals. To ensure its flawlessness at clients' end, the offered Improved Direct Paddy Seeder is tested on various parameters by our quality controllers prior to dispatching the delivery from our end. Agriculture TNAU Paddy Seeder is for sowing germinated paddy seed directly in wetland field. There is no need for transplantation. It is a manually pulled implement. It covers 8 rows of 20cm row-to-row spacing at a time. It is made up of plastic materials. With an aim to fulfill the wide needs of the agricultural sector, we are affianced in offering supreme quality Agriculture TNAU Paddy Seeder that is a gardening equipment used to plant rice seeds. It is designed & manufactured using the finest quality components and sound techniques under the supervision of skilled professionals. To ensure its flawlessness at clients' end, the offered Agriculture TNAU Paddy Seeder is tested on various parameters by our quality controllers prior to dispatching the delivery from our end. 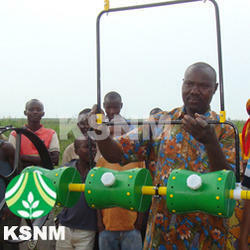 Agriculture Wetland Seeder is for sowing germinated paddy seed directly in wetland field. There is no need for transplantation. It is a manually pulled implement. It covers 8 rows of 20cm row-to-row spacing at a time. It is made up of plastic materials. With an aim to fulfill the wide needs of the agricultural sector, we are affianced in offering supreme quality Agriculture Wetland Seeder that is a gardening equipment used to plant rice seeds. It is designed & manufactured using the finest quality components and sound techniques under the supervision of skilled professionals. To ensure its flawlessness at clients' end, the offered Agriculture Wetland Seeder is tested on various parameters by our quality controllers prior to dispatching the delivery from our end. 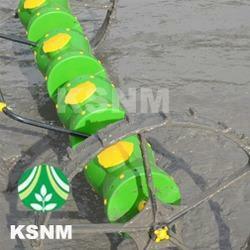 Direct Paddy Seeders Machine is for sowing germinated paddy seed directly in wetland field. There is no need for transplantation. It is a manually pulled implement. It covers 8 rows of 20cm row-to-row spacing at a time. It is made up of plastic materials. With an aim to fulfill the wide needs of the agricultural sector, we are affianced in offering supreme quality Direct Paddy Seeders Machine that is a gardening equipment used to plant rice seeds. It is designed & manufactured using the finest quality components and sound techniques under the supervision of skilled professionals. To ensure its flawlessness at clients' end, the offered Direct Paddy Seeders Machine is tested on various parameters by our quality controllers prior to dispatching the delivery from our end. 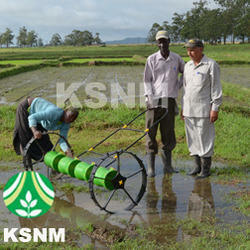 Wetland Seeder Machine is for sowing germinated paddy seed directly in wetland field. There is no need for transplantation. It is a manually pulled implement. It covers 8 rows of 20cm row-to-row spacing at a time. It is made up of plastic materials. With an aim to fulfill the wide needs of the agricultural sector, we are affianced in offering supreme quality Wetland Seeder Machine that is a gardening equipment used to plant rice seeds. It is designed & manufactured using the finest quality components and sound techniques under the supervision of skilled professionals. To ensure its flawlessness at clients' end, the offered Wetland Seeder Machine is tested on various parameters by our quality controllers prior to dispatching the delivery from our end.